Flowering: May-September. Annual, sometimes biennial. Native. 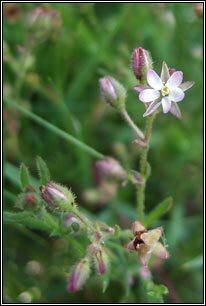 5-petaled pink flowers, petals shorter than sepals. White centres. 7 or less stamens. Most seeds without winged borders. Fleshy leaves, semi-cylindrical. Short stipules. 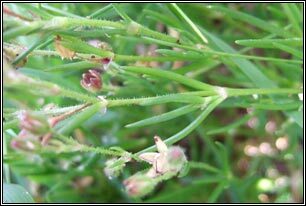 Glandular-hairy, sprawling plant. Height/spread: To 20cm. Coastal, dryer salt-marshes, sea walls, muddy shingle. 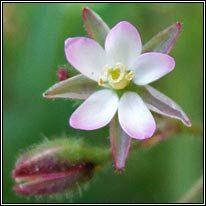 Similar: Greater Sea-spurrey, S. media. 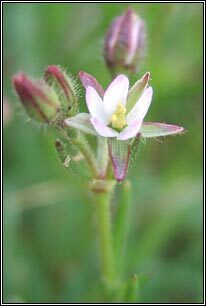 More robust plant.